Melt spinning is the most convenient and economic method for polymer fiber manufacturing at industrial scales. In melt spinning, the fiber-forming substance is melted for extrusion through the spinneret and then directly solidified by cooling. Melt spinning uses the heat to melt the polymer to a viscosity suitable for the extrusion through the spinneret. As the name indicates the chips of fibers are melted and extruded through the spinneret to obtain the fibers. It is used for the polymers that are not decomposed or degraded by temperatures necessary for extrusion. Polymer chips obtained from previously reacted chemical combinations are melted and then pumped through a spinneret in an air chamber. 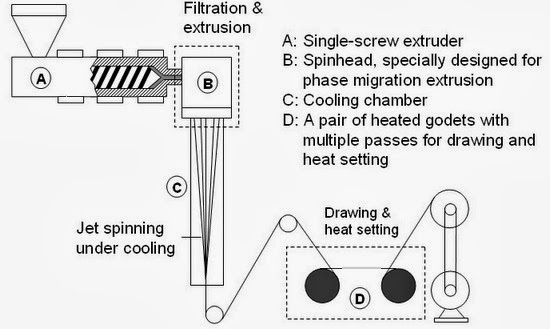 The extruded stream cool and solidify into continuous filaments and are then drawn out of the chamber twisted and/or processed further and subsequently wound onto spools. This method of spinning is suitable in manufacturing the polyester yarns. Melt spun fibers can be extruded from the spinneret in different cross-sectional shapes (round, trilobal, pentagonal, octagonal, and others). Trilobal-shaped fibers reflect more light and give an attractive sparkle to textiles. Pentagonal-shaped and hollow fibers, when used in carpet, show less soil and dirt. Octagonal-shaped fibers offer glitter-free effects. Hollow fibers trap air, creating insulation and provide loft characteristics equal to, or better than, down. The polymer should not decompose in the molten state and the melting point. Polymer should be 30 degree centigrade less than its decomposition temp. Different characterization methods were performed to study the resulting fiber properties, including microstructures, thermal properties, mechanical properties, rheological properties, molecular orientation and crystallization behavior. Polyester, Nylon, Olefin, Polypropylene, saran, and sulfar etc. are produced via melt spinning process. Can be used for both staple and continuous filament. High production speed (2500-3000) ft/min. Required more proper maintained of machine. Heat of input is high.